4 years & up. Get children moving as they use ribbons and scarves. 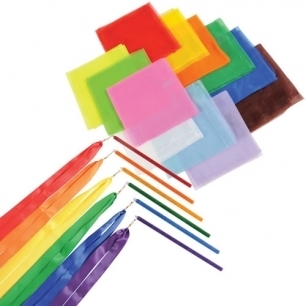 Our bright nylon scarves and rainbow ribbons are lots of fun to wave, toss, twirl, and more. Perfect for movement and music activities outdoors or indoors. Set includes 12 scarves (27" square) and 12 ribbons (each with a 12" wand and 36" ribbon).